Latest threat from China: Toxic Clothes? UK trading standards are on alert after Chinese-made clothes in New Zealand were discovered to have up to 900 times the safe level of formaldehyde in them. Formaldehyde is used to protect clothes that have to be shipped great distances against mildew. However, long-term exposure to high levels can be harmful, causing problems ranging from minor skin rashes to some types of cancer. The latest safety alert over cheap Chinese goods was sounded in New Zealand. It has been passed on to trading standards officials in Britain. “Any consumer worried about harm caused by clothes they have bought should contact the retailer or report their concerns to trading standards,” a spokesman for the Government’s new department for business, enterprise and regulatory reform said. 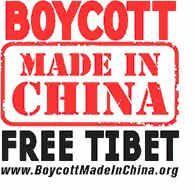 My reason for boycotting Chinese products is purely political — I support a free Tibet. Mommy Zabs, who started Not China Made.net, says, “Not everyone may feel led to ban or boycott China. But I am asking you to be aware, read labels, pay attention to just how much we as parents buy from China. It’s alarming.” I don’t have children, but do it for yours. I have always said, BE AWARE, READ LABELS, LIVE MINDFULLY. If you think one person can not affect change, you are wrong, and I will write about that at a later date. Great post. thank you for quoting and linking. I like the boycott china site too.